Contemporary retail may be all about omni-channel, social sharing, product information, and rich media, but in order to fully appreciate modern retail it's helpful to take a step back and appreciate the creativity of our ancient brethren. The following retail innovations are thousands of years old and still highly relevant to the modern world. Read, learn, and enjoy! Receiving paper purchase receipts may seem like a modern marvel, but believe or not the oldest known writing in the world is a receipt for clothing. More specifically, for a shipment of apparel shipped to Dilmun from Ancient Mesopotamia, an area of the Tigris-Euphrates river system that corresponds to what we know as Iraq, Kuwait, the northeastern section of Syria, a splash of Southeastern Turkey, and little bit of Southwestern Iran. Aside from creating the written word (no big deal, right) Mesopotamians are credited with the invention of metal and copper-working, glass and lamp making, textile weaving, flood control, water storage, and irrigation. Not too shabby. Thousands of years before you could drive over to Whole Foods and peruse about a hundred different brands of herbal supplements Chyawanprash, an herbal paste reported to have health benefits, was sold in India. This jam-like cooked mixture of sugar, honey, triphala, ghee, sesame oil, berries, and other herbs and spices has been sold continuously as a general health tonic ever since, and it can be consumed directly or along with warm milk or water. Nutritious, delicious, and the first "brand" in human history. Modern day vending machines sell everything from cheez doodles to lottery tickets to expensive perfume and high end skincare, but their history is longer then most of us realize. An Alexandrian engineer named Hero invented a machine which could despense holy water for four drachmas (the currency of ancient Greece) during the 1st Century AD. Mind = blown. Hero of Alexandria was a pretty dang inventive guy. Aside from creating the word's first vending machine, he's also repsonsible for the earliest known incarnation of the automatic door. A temple priest lit a fire in order to build heat and pressure in a brass vessel; when the neccessary pressure was achieved, it caused water to be pumped into adjacent containers which opened two doors when full. Think about that the in the two seconds of uncertainty (it's not opening yet...do I need to get closer? Will it hit me in the face?) the next time you navigate the modern version of Hero's ancient invention. There you have it ladies and gentleman, 4 ancient retail innovations that are still very much relevant to contemporary commerce. Hungry for more retail history? 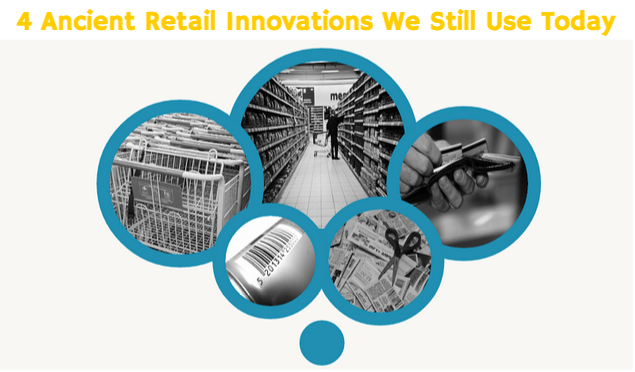 Check out the full list of Amazing Inventions that Revolutionize the Way You Shop by our friends over at Retale.